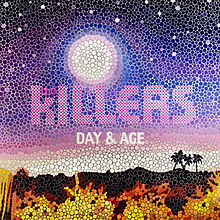 Day & Age is the third studio album by American rock band The Killers, released in November 2008 in the UK, Canada and the United States. Frontman and lead vocalist Brandon Flowers stated that it is the band’s “most playful record.”To date, Day & Age has sold over 3 million copies worldwide. Following the release of the album, the band embarked on the hugely successful worldwide Day & Age Tour. © 2019 Copyright The Killers Tour Dates.